Usain Bolt thrashes the competition to pick up his eighth gold medal in what he says is his last Olympics. 'I'm The Greatest!' Usain Bolt Is On His Way To A 'Triple Triple' after 200m Win! Usain Bolt said he hopes to be compared to sport's biggest icons such as Muhummad Ali and Pele, after picking up his eighth gold medal at the Olympics in Rio. The Jamaican sprinter thrashed his rival Andre De Grasse to come first in the Men's 200m final this morning after running an impressive time of 19.70, but admitted he was gutted to not have beaten the world record time of 19.30, which he set seven years ago in Beijing. "There are no words to explain. Eight time Olympic Champion. The 200m means a lot more to me and I have been enjoying it." Bolt said. "I was not pleased with my time. Even if you run a world record you still want to run faster, but my legs decided they aren't having it and I was so tired I lost my form on the last part of the race. "But the key thing is that you guys know I won and the only thing that matters is the gold medal." If Bolt wins the 4 x 100 m relay with the Jamaican team on Friday, he would make history by achieving a 'triple triple', by winning gold medals in 100m, 200m and relay at his third Olympic games in a row. Despite being the world's best, Bolt admits that age isn't on his side and competition from younger runners is part of his decision to bow out of the Olympics a legend. "There is nothing else I can do. I have proven to the world that I'm the greatest. That's what I came here for and that's what I've been doing. That is why it's my last Olympics. I can't prove anything else." 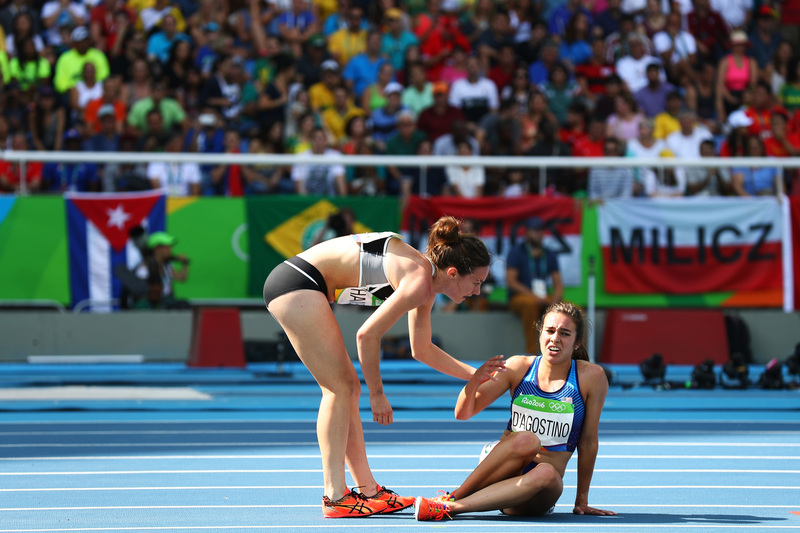 New Zealand and American distance runners, Nikki Hamblin and Abbey D'Agostino were both participants in the 5000m when 4 laps from the end they both collided and fell. They both hit the track and Hamblin lay in a ball on the ground confused about what had just happened. But competitor D'Agostino, who also fell, was there to spur them both on and jumped up to help her fellow runner onto her feet again. Despite falling way behind in the race at this point, the pair carried on together until D'Agostino, who was visibly in pain, began to falter and too fell to the ground. Returning the gesture, Hamblin stopped and reached her arms out to help the runner to her feet before they supported each other through the rest of the race. That is true Olympic spirit right there! 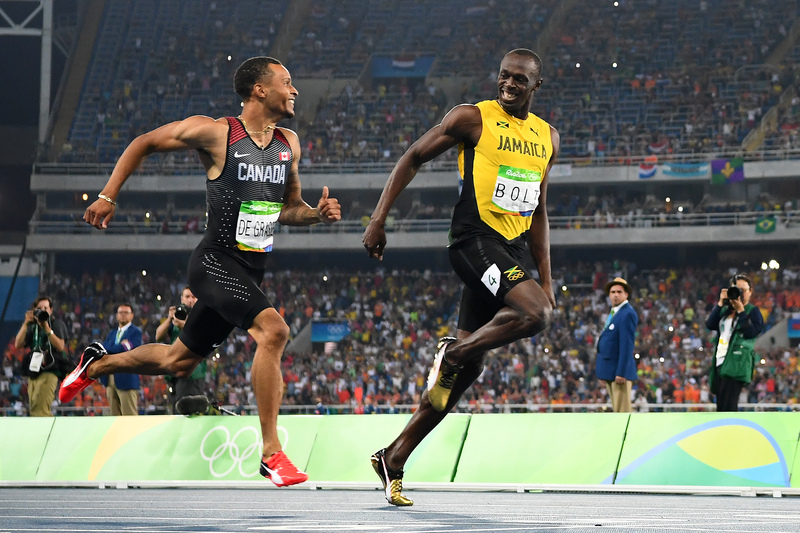 Usain Bolt Shares A Joke With Canada's Andre De Grasse! Usain Bolt again proved to be the cheekiest chap on the track as he shared a joke with De Grasse as they crossed when crossing the finish line of the 200m semi-final. The pair - who both qualified for the final - shared a glance with each other as Bolt slowed down to almost a jog while crossing the line and was almost pipped to the post by his competitor. 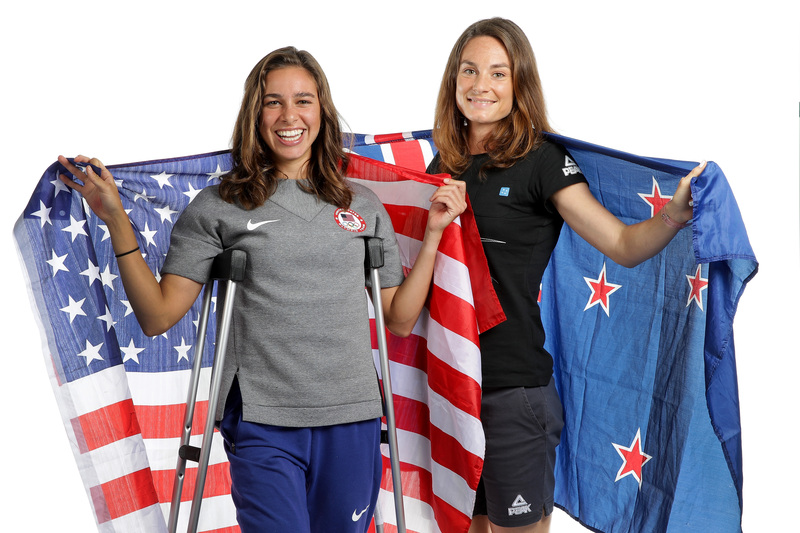 Read More: These Olympians Are Now Racing With Their Heroes! The men's cycling keirin final got off to a dramatic start last night when the race got off to two false starts. The race was stopped after riders appeared to break the rules by passing the 'derny' bike as it left the track. But after two attempts, Jason Kenny held his nerve and raced to gold - his sixth ever which now has him neck and neck with Sir Chris Hoy's medals tally. Laura Trott Posts Cute Tweet After Beau Jason Kenny Wins Gold! Laura Trott and Jason Kenny might just be our favourite Olympic couple yet! They've racked up the gold medals for Team GB and we've loved watching how adorably supporting they are of each other. But Laura's latest Tweet has made us all let out a massive AWWW! We see a tiny tricycle in their future!! 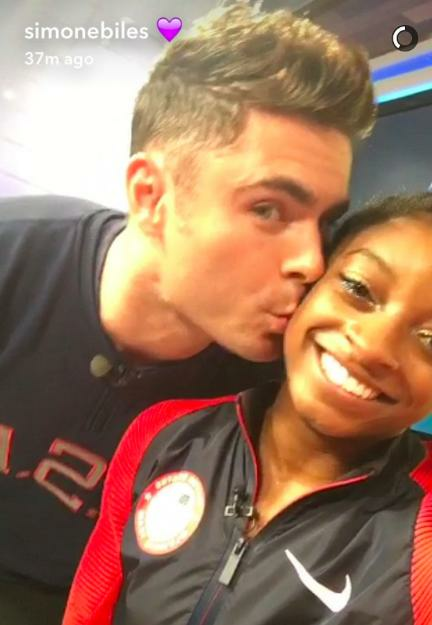 Zac Efron Plants A Kiss On Simone Biles! Simone Biles may seem superhuman thanks to her amazing gymnastics skills, but this latest encounter has reminded us that she is still just a teenager after all! The lucky gold medallist got to meet her crush Zac Efron in Rio and Snapchatted it for all her fans to see alongside the caption 'On cloud 9'. 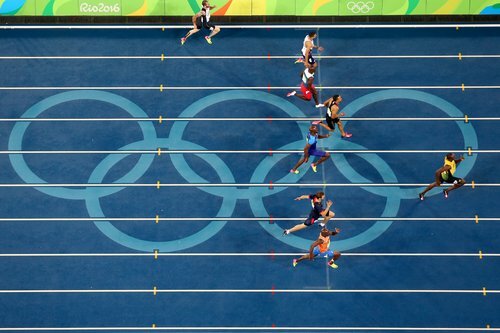 Read More: Determined Streaker Pulls Off The Best Olympic Dive So Far! Team GB are still hanging in there at second place on the medal table, next only to the USA who have a whopping 26 gold medals. Between them in Rio, our athletes have won a staggering 41 medals which include 16 gold, 17 silver and 8 bronze and we are so proud! On day ten of the games Sophie Hitchon bagged a bronze medal - the first British women's medal EVER - in the hammer throw. 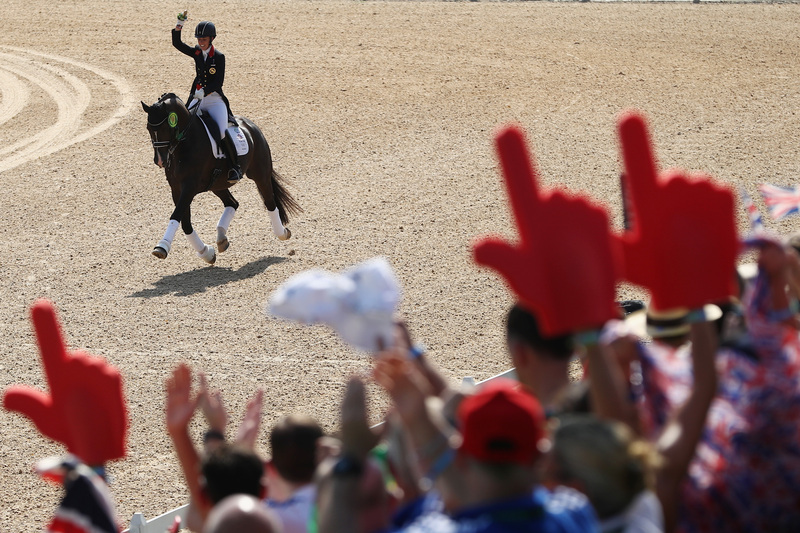 Charlotte Dujardin and her horse Valegro won the gold in dressage over in the equestrian arena and Mark Cavendish won silver in the men's omnium at the velodrome. Becky Adlington had her Instagram followers blubbing with her after posting a cute video of her daughter back at home. One year old Summer is seen to be pointing at her mum on the TV while she on presenting duties at the aquatic centre in Rio. The caption of the video is full of love for her little one with lots of heart emoji's and '#missyou #3moresleeps #crying'. We bet Summer can't wait to have her mum back from Rio! 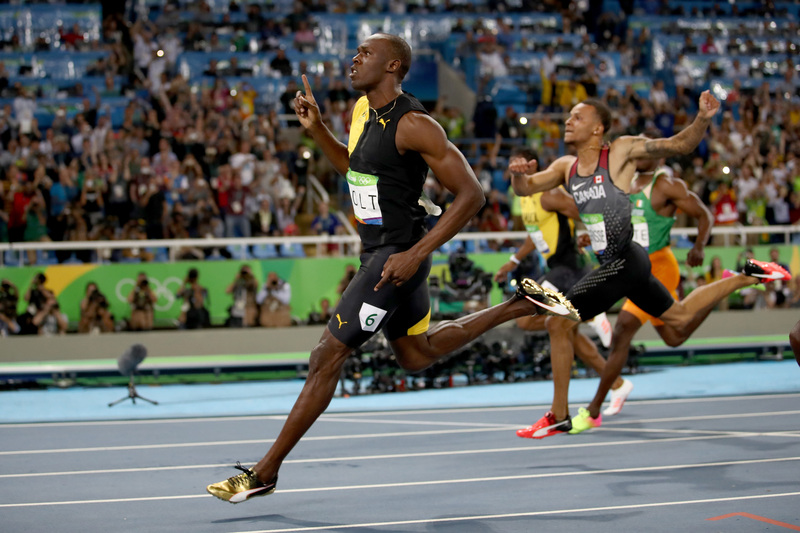 Usain Bolt Sparks A Flurry Of Memes After 100m win! 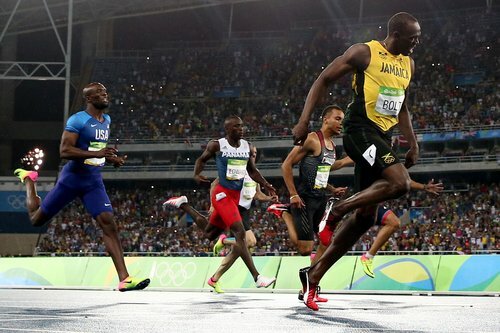 Fans have taken to Twitter to ridicule Usain Bolt's ability to make winning the 100m race look SO easy. The Jamaican sprinter was pictured flashing a cheesy grin for the cameras as he crossed the finish bound leaps and bounds ahead of his rivals. Shortly after the race, Twitter exploded with a flurry of memes comparing him to the likes of Roadrunner, while pictures of him photoshopped into comedic situations had us in stitches. 8 Medals on Day 8 of The Olympics! In what was a SENSATIONAL Sunday over in Rio, Team GB bagged a phenomenal 8 medals on the 8th day of the Olympics! Gold medals came from Andy Murray in the men's tennis and an elated Justin Rose who became the first British Olympic champion in golf for over 110 years. Max Whitlock bagged two gold medals in both the gymnastics pommel horse and floor competitions, becoming the first Brit Olympic champ in the latter. Over at the velodrome, Jason Kenny won his 5th Olympic gold in the men's sprint cycling final and Team GB's 14th gold of this Olympics taking us past China and into second position in the medal table. The Cycling Sprint Golden Boys Make Drunken Blunder! After winning gold in the men's team print finals at the velodrome on Saturday it's expected that the Team GB boys would want to celebrate! What makes it even more funny is that Owain Doull admitted that he discovered the note after actually thinking it was his room! LOL! Good job that handy note pointed him in the right direction, well done girls. Surprise Proposal At The Women's Diving Final! After just missing out on a gold medal to her team mate at the women's 3 metre springboard final, He Zi got another bit of surprise bling to add to her silver medal on Sunday. 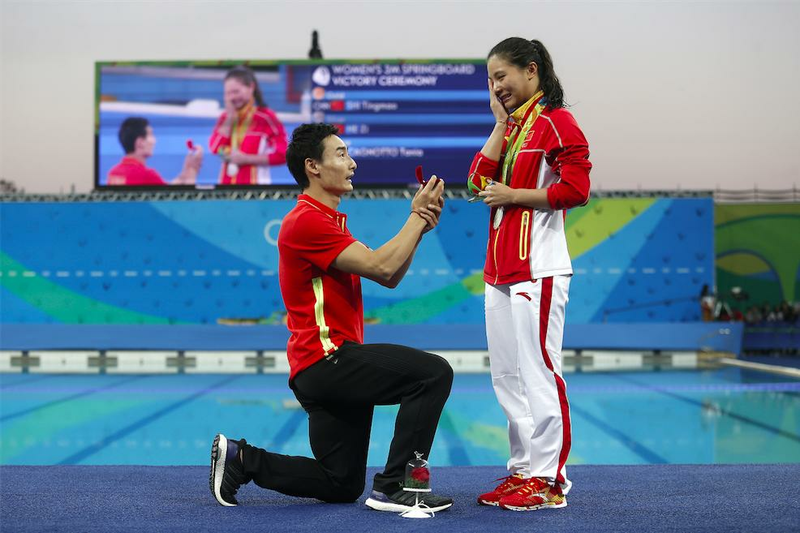 As she stepped down from the podium, boyfriend of six years and fellow diver Qin Kai got down on one knee and popped the question to a visibly surprised and shocked He Zi. And it's good news...she sad yes! After all the speculation that the pair may have a thing for one another, Mark Foster has hit back by revealing a fake 'tattoo' of his co-star's face on air this weekend, to the laughter of both Rebecca and their co-presenter Helen Skelton. Helen has been guilty of fuelling the fire over the couple's 'romance' by posting a picture of the trio on social media including a caption in which she called herself the third wheel. We wouldn't blame you even if the rumours were true Rebecca, Mark is SUCH a silver fox! Bolt Win's 7th Olympic Gold! As if he would ever lose eh? Usain Bolt won gold in the men's 100m final yesterday as everyone had anticipated, proving once again that he is unstoppable! The Jamaican athlete had a golden start to this year's Olympics and hopes to win two more gold medals in the 200m and men's 4x100m relay. We think he can do it! 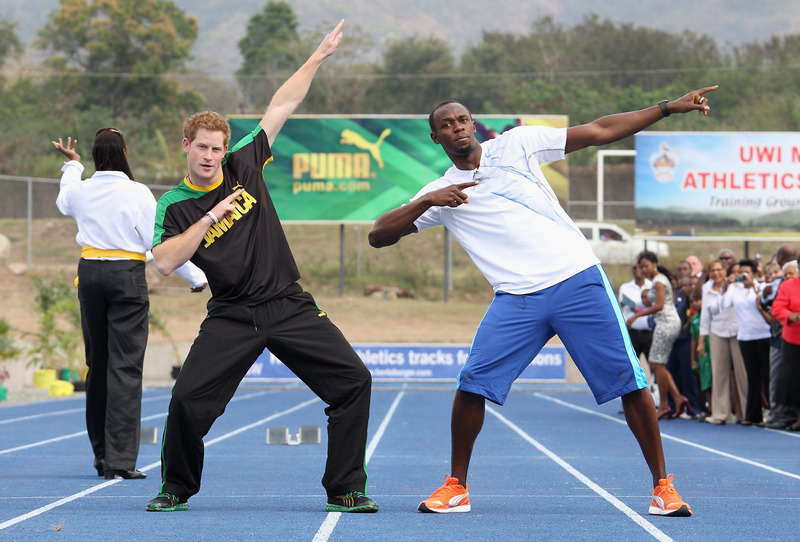 Usain Bolt and Prince Harry have become quite the friends over the years, and one moment that gave us particular friendship goals was the below from Prince Harry's tour of Jamaica in 2012 just before the London Olympic Games. And after winning his 100m gold medal at the Rio games, he said that he wants to party with his royal pal Prince Harry and 'teach him the running man!'. Sounds good, can we come along please boys?